When our old friend William Faulkner opined, “The past is never dead. It’s not even past,” he certainly wasn’t taking about the state of the gay rights movement in 2015. The hideous past is increasingly dead and buried, Bill, and we are dancing on its homophobic grave! What a year it has been! As the Pride parade barrels down Fifth Avenue on Sunday, June 28, exactly 46 years to the day after the Stonewall uprising (lavender cupcakes at my house! ), let’s take a minute to enjoy—to frankly wallow in—the victories of the past year. Not just the stupendous advances in gay marriage—legal in 37 states and the District of Columbia! Quietly legal in Mexico! 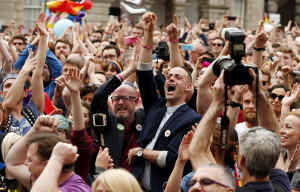 Legal in the entire country of Ireland, a wondrous and somewhat stunning turn of events—but a host of other LGBTQ triumphs as well. So sure, Caitlyn is on the cover of Vanity Fair, which we love—but also, Transparent has rocked the TV world, Laverne Cox continues her rise to super-stardom, openly gay Sam Smith won four top Grammys, Hozier had a huge hit with ‘Take Me to Church” (a powerful demand for equal rights) and the marvelous musical lesbian-bildungsroman Fun Home swept the Tonys. Later this year, Julianne Moore and Ellen Page will play lovers in Freeheld; Eddie Redmayne will trade Stephen Hawking for the part of a transgender woman in The Danish Girl. As Pride Sunday approaches, we await with near hysterical anticipation the Supreme Court’s imminent decision on whether all states will be required to respect each other’s laws when it comes to marriage, or maybe—we can dream—the court will rule that gay marriage should be legal in every state. End of discussion! Send a million rainbow-hued good thoughts in the court’s direction! Say a prayer if that is a power you believe in, or just wish fervently upon a star, that those nine justices, and the whole of America, will have the courage to stand on the right side of history. The post Happy Gay Pride Week! All the Victories We’re Celebrating This Year appeared first on Vogue. As an American and as an Episcopalian, I was raised to pledge to and pray for two audacious goals: “liberty and justice for all” and “thy kingdom come on earth as it is in heaven,” respectively. Yesterday’s historic step by the Presbyterian Church USA brought us a little closer to both. The powerful witness of a mainline denomination ending marriage discrimination is not only in alignment with the core American value of equality but a manifestation of the Gospel value of God’s inclusive love. It not only adds to the groundswell of movement toward civil marriage equality in this nation but debunks the false narrative that we must choose between religious liberty and equal protection for LGBT Americans. So today we celebrate the incremental victory of marriage equality in the Presbyterian Church. And then tomorrow we get back to work on the audacious goals of liberty and justice for all and a kingdom of God’s love, justice and compassion come on earth as it is in heaven. We get back to work on being a nation where the equal protection guaranteed all Americans actually equally protects all Americans. We call on the Supreme Court to end the discrimination against some marriages as we commit to a protect-marriage movement that protects all marriages. We stand up against “religious discrimination” legislation that is nothing more than a smokescreen for homophobia. And we look beyond the marriage wars toward ending employment discrimination, toward just immigration reform, toward passing the student nondiscrimination act, toward eradicating transphobia in all its manifestations — toward the long list of incremental victories we need to achieve before we can declare victory on those audacious goals I was raised to both pledge to and pray for. But today we celebrate, because yesterday’s historic step by the Presbyterian Church USA brought us a little closer to both — and the sound you hear is the arc of the moral universe moving just a little closer to justice.